A lack of flying experience contributed to the death of a pilot during an air display at a charity event, an accident investigator has told an inquest. 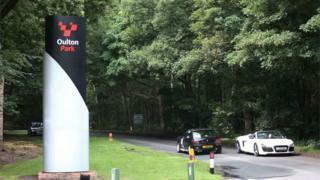 Kevin Whyman, 39, was killed when he lost control during a 360 degree roll at the CarFest North event in Oulton Park, Cheshire, on 1 August 2015. Geraint Herbert told the inquest a bid to regain control by reversing made the situation irrecoverable. The Children in Need fundraiser was set up by broadcaster Chris Evans. Mr Whyman, who was one of two pilots in the Gnat Display Team, crashed his Folland Gnat high-performance military jet in a wooded area one mile north of the festival site. The inquest at Warrington Town Hall heard he was attempting his second 360-degree roll when the nose of the jet dropped unexpectedly. He sustained multiple injuries from the impact and was pronounced dead at the scene. Mr Herbert, from the Air Accidents Investigation Branch, told the hearing that Mr Whyman was faced with a startling, time-critical situation when he carried out the "inappropriately timed" action. He said it caused the rate of descent to increase and made the situation irrecoverable. "It was our conclusion that the pilot's relatively low experience played a part in the inappropriate recovery." The court heard Mr Whyman, who had previously served in the RAF, was managing director at Credit Suisse at the time of his death. His logbook recorded 418 hours as a pilot in command - which classed him as "intermediate" by the Civil Aviation Authority - rather than the 450 hours required to be termed as "experienced". The other pilot performing at the festival, Mark Fitzgerald, queried why investigators had not looked in more detail at why the second roll stopped at 107 degrees. Mr Fitzgerald said he had performed the manoeuvre more than 1,000 times. "Something must have caused the pilot to take a very unusual action to stop the roll like that halfway through. "It is very, very rare you would have someone recover from that point." Mr Herbert said: "We don't know why the nose dropped... we concluded something odd had happened and he was trying to recover the aircraft."